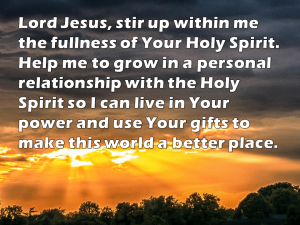 Dear Father, in the name of my Lord Jesus Christ, I ask you to stir up within me the fullness of Your Holy Spirit. Help me to grow in my relationship with the Third Person of Your Holy Trinity and to live in His power and use His gifts. Lord Jesus, You promised, “The Counselor, the Holy Spirit, whom the Father will send in my name, will teach you all things and will remind you of everything I have said to you” (John 14:26). Help me to remember that I don’t know everything, and that this is okay, because the Holy Spirit understands it all. Fill me with the Holy Spirit and His understanding of everything that is happening in my life. O Holy Spirit, Jesus asked the Father to give me the Spirit of Truth (John 14:17). Help me to recognize You in the scriptures. Open my mind to understand Your truths, and open my heart to accept Your truths in faith even before I gain right understanding. O Holy Spirit, Jesus said, “The one who receives the seed that falls on good soil hears the word and understands it. He produces an abundant crop” (Matt. 13:23). Be the gardener of my life. Nourish the seeds of heaven that You have already placed within me and make it grow so that Your love, Your ways, and Your kingdom will always grow within me and produce much good fruit for others. O Holy Spirit, Jesus said, “Do not worry about how you will defend yourselves or what you will say, for the Holy Spirit will teach you what you should say” (Luke 12:11-12). Help me to trust in You always. Help me to remember that with You, nothing is impossible, and that You work everything according to what is good and right and timely, even if it doesn’t seem so to me. O Holy Spirit, Jesus said, “Seek first his kingdom and his righteousness, and everything else you need will be given to you as well” (Matt. 6:33). Help me to let go of all my earthly attachments. First help me to recognize what I am attached to that is not of You, and then hold my hand as I walk away from the things of the world. Give me the determination and the strength to let go so that I have no other gods before me. I want only You. O Holy Spirit, You are the Comforter. Help me to let go of the losses in my life. Heal my heart. And help me to face my sinfulness and to feel genuine sorrow for the damage ~ both intentional and unintentional ~ that I have inflicted on others and in so doing have inflicted on Jesus. Comfort me as I mourn my need for forgiveness, and give me Your spirit of rejoicing over this new growth in me. O Holy Spirit, Jesus freely chose to suffer and die for me because of His tremendous love for me. I have pains in my life ~ hurts, wounds, sufferings, trials, difficulties ~ and I want to run from them. Strengthen me to follow in Jesus’ footsteps so that I can walk my road to Calvary without fearing evil, and lead me into my new life of victory and resurrection. 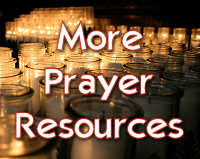 O Holy Spirit, Jesus said that He would not leave us orphans, but would send You to us (John 14:18). How often I have wept or complained because it seemed like You were not with me in my sorrows and sufferings! Help me to recognize Your presence in ALL situations. Help me to turn to You and find You, for You never leave me nor abandon me. You care even more about me and my problems than I do. You are working a plan for my benefit, to make good come from everything that happens to me. Help me to discover Your presence in every moment of my life. O Holy Spirit, by the cross of Jesus we are healed! By His resurrection we live in the new life of total, unconditional love. Help me to share that healing love with all those around me. Jesus commanded, “Go into all the world and preach the good news to all creation.” Help me to declare with power the Good News of Jesus Christ. Send me to where You can use my gifts and talents to make a difference. O Holy Spirit, You gave Yourself to the Virgin Mary and she said “yes” to becoming the mother of the Messiah. Help me to say “yes!” to whatever it is You are calling me to do. I want to serve the Father and make Jesus’ love more evident in the world around me. O Holy Spirit, I have my own expectations about what I should and should not do. I now surrender to You my ideas, my limitations, my preferences, and my goals. 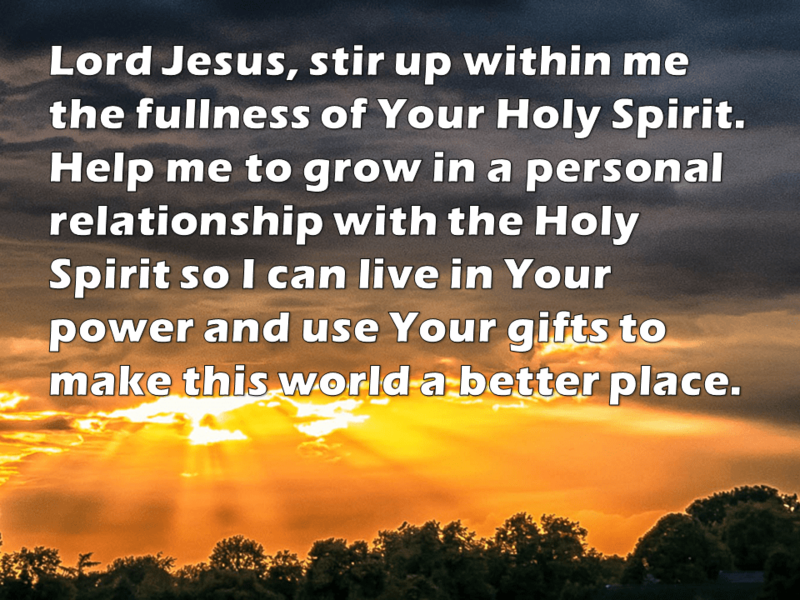 Fill me, Holy Spirit, with all Your supernatural gifts! Empower me to accept and grow in the supernatural life as much as the early disciples did. I want to be useful to You. I want to go where You lead me. Holy Spirit, send me forth gifted and empowered to make a difference spreading the Good News of God’s forgiving love. Come, Holy Spirit; renew me. In Jesus’ name, Amen! 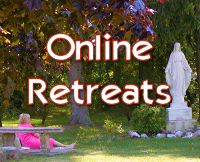 Thanks for the beautiful reflection as well as for the link to the Prayers to the Holy Spirit. I saw this link about a year ago, printed it and use it very often during my prayers. 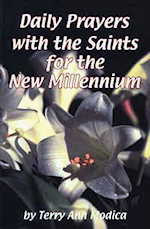 You mentioned about the Baptism of the Holy Spirit being a necessity in one’s spiritual life. Let me share a little on this subject. 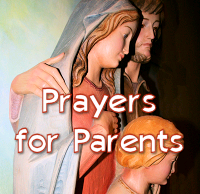 My wife and I were in quite a bad spiritual state (practically anti-God) when we were told that we could not have a child. The Lord in his mercy drew us to a prayer meeting where there were testimonies by people from various faiths including some priests and leaders from the local Charismatic Renewal. We listened in particular to two gentlemen, a father and son. Their testimony was so powerful and it touched us so much that I went forward to be prayed over when the call was given and was prayed over by the older gentleman mentioned earlier. It was such a dramatic experience that it gives me shivers even when I think of it today, 30 years later. I was in tears, shaking and shivering, and I received the gift of tongues on the spot. My wife saw my experience, and she too went up and had a similar experience. Life was completely different after that. We were able to tell the Lord that even if he wanted us to be childless, we would be happy, as his will was more important that our want. It is only after this acceptance that the Lord gifted us with a son ten years into our marriage. The idea of this sharing is to inform those who have not had the privilege of the Baptism of the Holy Spirit to go ahead and attend a “Life in the Spirit Seminar” and I can guarantee you that it will be an experience that will overhaul your life. Or read: Who is the Holy Spirit?